＊Please contact us if you are interested in this seminar. Mechanoelectrical transduction in the inner ear is a biophysical process underlying the senses of hearing and balance. 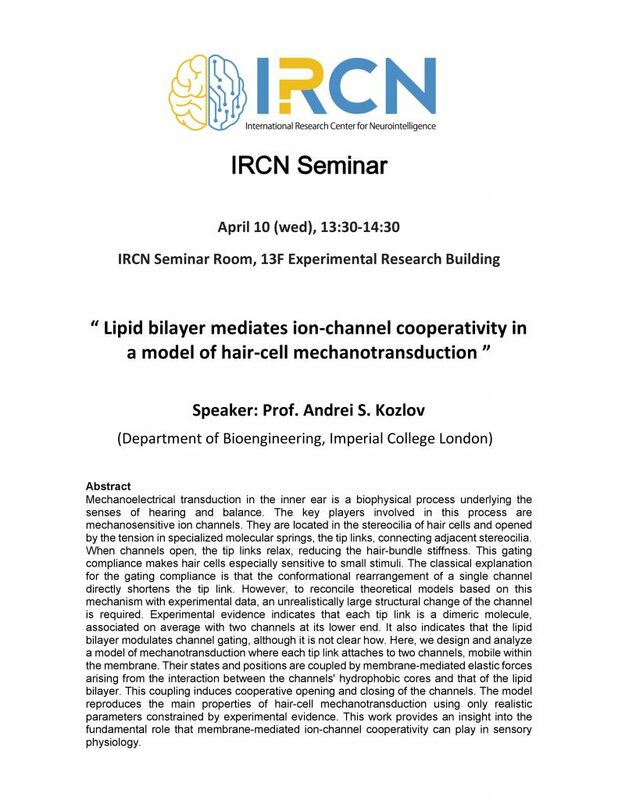 The key players involved in this process are mechanosensitive ion channels. They are located in the stereocilia of hair cells and opened by the tension in specialized molecular springs, the tip links, connecting adjacent stereocilia. When channels open, the tip links relax, reducing the hair-bundle stiffness. This gating compliance makes hair cells especially sensitive to small stimuli. The classical explanation for the gating compliance is that the conformational rearrangement of a single channel directly shortens the tip link. However, to reconcile theoretical models based on this mechanism with experimental data, an unrealistically large structural change of the channel is required. Experimental evidence indicates that each tip link is a dimeric molecule, associated on average with two channels at its lower end. It also indicates that the lipid bilayer modulates channel gating, although it is not clear how. Here, we design and analyze a model of mechanotransduction where each tip link attaches to two channels, mobile within the membrane. Their states and positions are coupled by membrane-mediated elastic forces arising from the interaction between the channels' hydrophobic cores and that of the lipid bilayer. This coupling induces cooperative opening and closing of the channels. The model reproduces the main properties of hair-cell mechanotransduction using only realistic parameters constrained by experimental evidence. This work provides an insight into the fundamental role that membrane-mediated ion-channel cooperativity can play in sensory physiology.